It has become commonplace to view the process of European integration as limiting the scope for welfare provision. Yet, here we seek to show how a similar (less often noted) process of opposition and disruption has also acted to limit this attempt at welfare retrenchment. The onset of crisis in 2008 has witnessed increased disciplinary pressures from global markets and European institutions and an attempt to further de-politicise budgetary discipline through a series of measures largely associated with the European response to the crisis, which have in turn been meet by increased everyday vulnerability and social inequality, a deepening legitimacy crisis of national and European institutions. At the same time, we also see mass protests that have (at times successfully) pushed for a re-politicisation of welfare reforms and the emergence of new forms of pragmatically prefigurative disruptive agency. Welfare during the European crisis: the age of impeded austerity? The post-2008 period witnessed a heightened attempt to reform, restructure and reduce the generosity of Europe’s welfare states. The increased capacity of investors to scrutinise national governments further limited welfare spending. This, moreover, was combined with a renewed commitment on the part of Europe’s supranational elite to adopt institutional rules that would lock-in a commitment to fiscal orthodoxy and major attempts at welfare retrenchment. It also prompted the development of new anti-austerity social movements, expressing deep-rooted hostility to the established political and economic elites. As a result, rather than a smooth process of neoliberal restructuring post-2008 (and especially post-2010 when the European manifestation of the crisis became most intense), we witness instead a dramatic heightening of the politicisation of welfare. Governments’ attempts to dismantle the provisions for social security faced massive opposition. These protests were at least partly able to hinder austerity-based attacks on welfare, whilst at the same time contributing to a political crisis by successfully questioning governments in their attempts to claim, ‘There is no alternative’. As we have seen, however, whilst this crisis of legitimacy was in some ways a source of hope for those seeking to develop more radical and prefigurative forms of disruptive agency, at the same time the depth of disaffection and disengagement that it reflected of wider society was also a phenomenon that could be fostered and built upon by political actors propagating right wing populist welfare chauvinism. The financial crisis of 2008 had a significant effect upon welfare spending. This was compounded by the system of European crisis management that saw the incremental introduction of a range of different measures (such as the ‘Six Pack’, the ‘Two Pack’, the European Semester, the Memoranda of Understanding (MoU) or the EFSF and the ESM). These acted to ‘lock in’ competitiveness in a step-by-step manner, leading to austerity being the only viable political solution to the crisis. This new form of economic governance created political pressure through constant surveillance, combined with a ‘mix between conditionality and ‘backroom’ diplomacy’ (Pavolini et al., 2016). As a result, welfare state arrangements were destabilised and pro-cyclical austerity policies were imposed, each of which threatened to dismantle the European social model and erode social cohesion. The role of the European institutions in this process are particularly important to note, and especially that of the European Commission. Thus, as the debt problems facing Europe – and especially the peripheral European economies – became apparent in 2010, the European Commission began to focus in earnest on the issue of fiscal consolidation, as did the financial markets. With the task of managing Europe’s public debt beginning to look increasingly difficult, the Commission consistently voiced concern that public debt could rise to over 100%. The prescription advised by the Commission, therefore, was a sharp contraction of public spending: ‘Very sizeable budgetary consolidation will be necessary in many Member States to bring public finances back on a sustainable path’ (European Commission 2010). This necessary reduction in net public spending, the Commission estimated, would amount to around 5% of GDP. It is with these concerns in mind that we can understand the attempts by the Commission to consistently push for fiscal contraction during the 2010-15 period. 23 of the 27 member states were subject to the SGP Excessive Deficit Procedure during this period. This was built on a conviction that postponing consolidation would only act to increase the overall cost of debt servicing over time (and should therefore be avoided). As a result, the Commission recommended a 1% GDP reduction in debt per year, double that which was constitutionally required by the terms of the SGP (European Commission 2011). There was, therefore, clearly downward pressure upon public spending, and especially welfare provision, throughout the post-2010 period, as a direct result of the process and institutions of European integration. It is important to note, however, that this political pressure produced only a small reduction in average government deficits and the reduction in government deficits that was achieved was done largely through an increase in revenue rather than through the successful reduction in public expenditure (European Commission 2016). Much of the critical political economy literature has focused on the pressure emerging from the European Union and its impact upon national welfare states and welfare retrenchment during the European crisis period. We need also to consider, however, the new forms of disruptive agency that have emerged in this context of heightened pressure for retrenchment, which we might argue acted to restrict the degree to which welfare retrenchment could be carried out as intended by Europe’s political and economic elites, as we see below in the cases of the UK and Spain. One of the first major protest events that took place after the 2008 crisis, and which arguably initiated the UK’s anti-austerity movement, was the two-day series of demonstrations against the G20 meeting which took place in London on 28 March and 1 April 2009. These witnessed a combination of moderate Put People First demonstration (28 March) and radical G20 Meltdown (1 April) protests, designed to allow a plurality of different protesters to highlight their displeasure at the crisis and to demand a social justice focus in response. This was also the first major set of summit protests after the global economic crisis struck in September 2008, witnessing the more militant of the two days (1 April) focus on a range of grievances and causes, with four starting points each led by one of the ‘Four Horsemen of the Apocalypse’, and converging on the Bank of England. The symbols used for the demonstration were: a red horse against war, a green horse against climate chaos, a silver horse against financial crimes, and a black horse against land enclosures and borders. In bringing together peace movements and anti-environmentalism, within a demonstration that was explicitly focused on anti-austerity and the global economic crisis, this demonstration represented an important opportunity to build alliances between different groups and activists with different backgrounds and attitudes. Indeed, many of these groups would subsequently contribute to the development of the anti-austerity movement. Given its status as a non-Eurozone member, the UK was clearly not subjected to the same degree of EU-level control as other member states. The UK was also one of only two countries that chose not to sign the so-called ‘fiscal compact’ in 2012, thereby further releasing the government (at least in principle) from the need to cohere with EU-level demands for fiscal orthodoxy. That said, the Stability and Growth Pact does apply to the UK and as a result it was subjected to the EU’s system of annual ‘convergence reports’, according to which budget deficits were required to be within a target of 3% of GDP. Moreover, the Coalition Government consistently pointed to the impact of high levels of public debt in the Eurozone peripheries, and the subsequent sovereign debt crises experienced there, as an indication of the need for national debt to remain low. This approach was evident immediately after entering office. For instance, speaking in June 2010 Prime Minister David Cameron was quick to highlight the risk of ‘becoming-Greece’ and the urgency with which austerity therefore needed to be adopted. In this sense, therefore, the UK experienced many of the same ‘peer pressures’ that come with EU membership – both in the sense of experiencing pressure from the Commission to conform to fiscal orthodoxy, but also with regard to the impact that came with market integration and the pressure to be ‘competitive’ (as well as assisting members of the national political and economic elite in justifying a national obedience to that pressure). Indeed, it is this latter pressure that was most relevant in the case of Cameron’s coalition government, for whom the pressure to conform with fiscal orthodoxy was openly embraced, and the ‘basket case’ status of those European countries that refused to accept it was enthusiastically condemned, along with a heralding of the detrimental consequences for those who adopted the ‘basket case’ option. Perhaps the most significant and sustained form of visible campaigning against welfare austerity was that witnessed with the UK Uncut campaign. This began in October 2010, in direct response to the Comprehensive Spending Review published in the same month, and lasted for nearly a year before its activity was seriously curtailed following the arrest and conviction of a number of UK Uncut activists during the Fortnum and Mason protest in March 2011. The main aim of the protest movement – which typically focused on the occupation of retail stores, or disruptive direct action protests directly outside the stores – was to both highlight the unfair way in which the budget deficit was being addressed, and to advocate an alternative means of doing so, through measures to end tax avoidance (see below for a fuller discussion). This use of occupations and direct action tactics were also invoked by other anti-austerity protest initiatives. For instance, the February 2011 Save Our Libraries campaign used a combination of both ‘mock’ occupations (in which library users staged ‘read ins’ to highlight the popularity of the libraries) and ‘real’ occupations (for instance in the case of Barnet library, the closure of which was avoided as a result of an occupation and taking control of the library by local residents and activists). Similarly, the Occupy movement, which began in October 2011, focused explicitly on anti-austerity goals. For instance, the Occupy London Economics Statement, agreed at the General Assembly by St Paul’s Cathedral on 6th December 2011, included a clear attack on the Government’s austerity agenda. More standard public demonstrations were also routinely conducted throughout the austerity period. This includes the March 2011 demonstration staged by the TUC, and annual demonstrations by the People’s Assembly Against Austerity that began in 2013. The strategy that UK Uncut adopted was one of direct action. This involved performing stunts in or outside of shops accused of tax avoidance, in such a way that would maximise disruption and the publicity and attention that the shop in question would experience. The purpose of the campaign was to force the shop in question to do more to pay taxes owed, and to bring attention to the issue of tax evasion around which UK Uncut were campaigning, as well as demanding that the government do more to collect these taxes (Street 2015). These were tactics that had been developed over time by a number of the campaign participants, with many having links to more recent environmentalist groups, especially the annual Camp for Climate Action which was a high-profile direct action environmentalist event on the activist calendar prior to 2008, and the campaign group People and Planet, as well as being connected to the student movement happening concurrently alongside the UK Uncut movement. One of the aims of the campaign was to insist that austerity measures were neither necessary nor unopposable. The initial target taken up by UK Uncut was Vodafone, chosen due to the allegations circulating that it had benefited from an alleged £6b tax write-off deal with the government. Protests took place both online and in physical space, with 1000 people signing UK Uncut’s online petition in October 2010. This was a move accompanied by the first action of the group, in which activists gathered at the Oxford Street London branch of Vodafone to stage an occupation of the store in protest at its alleged tax avoidance. At the time of its initiation, moreover, the group of activists set out explicitly to ‘kick-start’ an anti-austerity social movement (Street 2015). This first event was subsequently followed during November and December by staged occupations and protests outside the premises of Vodafone in stores across the country, including Brighton, Glasgow, Birmingham, Liverpool, Edinburgh, Leicester, York, Bristol, Portsmouth, Southampton, and Cambridge. December also saw UK Uncut prompt another Twitter attack on Vodafone, this time in response to the company’s Christmas-focused PR stunt. Further protests focused on shops owned by Philip Green, including Topshop, Dorothy Perkins, Burton and Miss Selfridge. The UK Uncut protests continued into 2011, targeting Boots in a day of action during January. Perhaps the most notorious act of UK Uncut, however, was the occupation of Fortnum and Mason, which eventually resulted in criminal charges being made against the protesters in an apparent (and relatively successful) attempt to put an end to the movement. In terms of the impact of the protests, the two central goals were to highlight and politicise tax avoidance as an issue that was undermining public funding, and therefore move away from a discourse that blamed excessive welfare spending for poor government finances. In addition, the movement sought to question the discourse of the government – that austerity measures were both unavoidable and that the burden of addressing the shortfall in public finances was being shared across the population. Indeed, UK Uncut managed to use an innovative strategy of direct action protest, coordinated in an open and loose manner that was easily replicable. It caused significant media attention and politicised both the decisions of the Coalition Government to focus on welfare cuts as the means by which to balance the budget, and the unequal way in which it was doing. The method of protest, moreover, produced direct disruption to the operation of a number of key firms that were alleged to be benefiting from the Government’s leniency towards them. As such, this represented a significant problem for the Government, particularly in terms of the impact that it had upon (a) their claims to have their hands tied by the budget deficit, and (b) claim that ‘we are all in it together’. It is perhaps noteworthy that almost all of the austerity measures imposed by the Coalition Government were announced in its first 2010 emergency budget; that is, before the significant politicisation of the issue of austerity, which UK Uncut contributed considerably towards. Further, the Coalition Government absolutely failed to reach its public sector spending savings and balanced budget during its 2010-15 term, again potentially due to the adverse publicity it attracted as a result of its attempt to do so. One of the Coalition Government’s most draconian set of welfare reforms was in the area of ‘workfare’. This represented an extension of what was commonly referred to as the ‘employability’ agenda of the preceding government and sought to tackle unemployment through the use of a range of work experience schemes – this included the increased use of private firms to provide the ‘workfare service’ and the use of sanctions to enforce participation (Rees et al., 2014). The Coalition’s workfare programme therefore represented an attempt to reduce welfare provision by increasing the degree to which unemployed benefit claimants were coerced into alternative forms of work (many of which would have otherwise been resisted), through a combination of sanctions for benefit claimants and financial incentives for private sector placement providers (who were also therefore incentivised to impose sanctions as a means by which to discourage unemployment benefit claimants from taking up benefit entitlements). In terms of everyday forms of dissent, perhaps one of the most marked was that highlighted in the work of Rees et al. (2014). They showed how unemployed workers who proved most difficult to place in the scheme often found themselves ‘parked’ by private firms paid according to their performance in terms of achieving long-term employment. This payment system therefore incentivised firms to concentrate their efforts on those most likely to achieve long-term employment. As a result, benefit claimants were able to ‘game’ the system due to private placement firms’ much greater focus on those unemployed workers who the firms felt were most likely to be employable and therefore likely to find a longer-term placement (as this would result in the private firms being financially rewarded). Alongside these imperceptible forms of everyday dissent, a prominent and at times highly successful campaign organisation – Boycott Workfare – emerged to promote the interests of those being subjected to workfare provisions, and to seek to find ways to oppose the reforms. The group was formed in 2010 following the announcement of the new Conservative Government, that it would be introducing a number of new workfare policies, by a collection of those affected by workfare, and largely with a background in campaigning against government welfare cuts. The strategies adopted by Boycott Workfare were largely of a direct action nature, with a prevailing sentiment that this was necessary in order for the voice of the unemployed and other benefits claimants to be heard. From its outset this focused especially on targeting retail stores. The campaign used a combination of tactics, including: publishing online material that spelled out the implications of the government’s workfare scheme and seeking to build opposition to it; publicising the names of the companies that were participating in the scheme, in an attempt to associate the reputation of the company with what was portrayed as an unfair and immoral scheme that undermined the voluntary nature of volunteering; publicising the experiences of individual participants in the scheme; direct action demonstrations outside of and sometimes inside the premises of participating companies and charities; support for legal challenges against the scheme (although this was normally moral support rather than financial); disrupting public meetings at which government ministers were speaking and a series of freedom of information requests (and making public how others could submit FoI requests) that sought to highlight and publicise those companies that were involved in the scheme. Much of the campaign work undertaken by Boycott Workfare, therefore, relied upon reputation damage – using the slogan, ‘If you exploit us, we will shut you down!’ – and highlighting and publicising the companies involved. In doing so, moreover, it was successful in securing the withdrawal of participation of a sizeable number of organisations – to the extent that the government increasingly found it difficult to operate the scheme. In March 2012, and building on the publicity gained in the national press, Boycott Workfare coordinated a series of nationwide actions. In the context of this ongoing negative publicity, participating companies and charities increasingly moved to withdraw from the scheme – claiming that they did not want to participate in a scheme which was not voluntary – this included Sainsbury’s, Waterstones, HMV, Marie Curie, Shelter, Matalan, 99p Stores, Maplin, and Burger King. The number of withdrawing companies and charities also continued to rise throughout the following years. Indeed the Government itself acknowledged the impact of the protests in its ongoing attempt to avoid releasing the names of participating organisations. This followed a ruling made by the Information Commissioner in 2013 that the Government must release the names of participating firms in the workfare scheme. It was not until July 2016, however, after a four year legal battle led by Boycott Workfare member, Frank Zola, that the government was eventually forced to release the information stating which organisations had been involved in workfare (with over 500 organisations named) (Boycott Workfare 2016). Previous targeted campaigns had resulted in the withdrawal of providers from MWA [Mandatory Work Activity scheme] and WE [work experience]… Put simply, disclosure [of names] would have been likely to have led to the collapse of the MWA scheme. Further still, in its own evaluation of the workfare scheme, the government announced that, ‘The high profile withdrawal of placements from a number of larger charities meant a sharp reduction in placements’ (DWP, Evaluation of Mandatory Work Activity, 2012, quoted in Boycott Workfare 2013). There is, therefore, substantial evidence, provided by the Government itself, that the actions of Boycott Workfare had a significant impact upon the attempts to implement its Workfare scheme. Adverse publicity was therefore both a central and a successful element in the campaign against workfare. Holland and Barrett was one of the largest profile companies to pull out of the scheme, after initially employing 1000 unpaid workers between 2011 and 2012 – eventually citing ‘bad press and in-store protests’ as its reason for withdrawal. In 2014 the government introduced a new scheme – Community Work Placements – which threatened to impose six-month unpaid work placements upon unemployed people. The scheme, however, suffered from the same adverse publicity that surrounded other government workfare schemes. The most significant sign of this was the creation in April of a campaign, Keep Volunteering Voluntary, which was initially set up with input from Boycott Workfare and signed up to by over 25 groups, including Oxfam and the National Association for Voluntary and Community Action. Since its creation the initiative has secured the support of a huge number of charities, with 150 groups signing up by the time of the launch of the scheme, and by 2016 boasting over 600 signatory organisations, including Child Poverty Action Group, Friends of the Earth, the Scottish Council for Voluntary Organisations, Shelter, Sue Ryder, Unison and scores of volunteering groups. Alongside attempts to expose the participation of organisations and firms in the workfare scheme, Boycott Workfare were also able to provide information to participants in the scheme, spelling out their rights and elements of the scheme that they had the right to refuse to participate in. For instance, in 2011 the organisation made it clear that participants were under no obligation to provide confidential personal information, which A4e (one of the scheme providers) was requesting from participants. Similarly, the group were able to offer advice on the implications of the High Court ruling which stipulated that the workfare scheme (except for Mandatory Work Activity) were unlawful (Boycott Workfare 2013). Finally, one of the most high-profile forms of opposition to the Government’s Workfare programme was the legal challenge brought against it by two benefit claimants who had been forced to do unpaid work in order to continue to receive their benefits. In one case, the claimant (Cait Reilly) was forced to give up her voluntary work in order to work in Poundland. In the other case, Jamie Wilson was required to do unpaid cleaning and renovation work. In bringing their challenge against the Government the two claimants built their case upon four key claims, including that the Regulations upon which the scheme was based were both legally insufficient (i.e. the Secretary of State had acted beyond the powers granted by Parliament), had not been properly followed, and that the scheme amounted to a Human Rights violation on the grounds that it constituted forced/compulsory labour. Despite losing their initial claim, upon appeal (in 2013) it was decided that the Government had acted outside of the terms set by Parliament, and so the scheme was deemed unlawful (although the claim of forced/compulsory labour was not upheld by any of the courts). This subsequently led the Government to pass emergency legislation – the Jobseekers (Back to Work Schemes) Act 2013 – which retrospectively ensured that the scheme was lawful and that therefore no claim to recover benefit sanctions could be made (Adkins, 2015). In sum, therefore, the government’s workfare scheme – a particularly draconian attempt to impose tight conditions upon the unemployed and to significantly scale back the generosity of unemployment benefits, to the point that many claimed it had moved to the imposition of forced labour – met with fierce public opposition, using a range of oppositional tactics. These especially sought to build upon a broad public opposition to the scheme, publicising the most obnoxious forms that it took, and seeking (oftentimes successfully) to disrupt the implementation of it through a name-and-shame approach that combined physical protests in high street stores and online adverse publicity. From 2008 onward, the pre-crisis accumulation regime in Spain collapsed due to a real estate crisis, over-accumulation and collapsing demand in the automotive industry and credit shortages in the aftermath of the US subprime crisis. Unemployment soared, which led to rising investments due to automatic stabilisers (e.g. unemployment benefits). The mortgage repayments of hundreds of thousands of Spanish citizens were thereby put into question. To secure the availability of credit, moreover, the state intervened in the financial sector, especially focusing its efforts on the bank, Cajas de Ahorro, which had been largely dependent upon the mortgage market. In order to secure the country’s financial sector it was necessary, in 2012, to borrow from the European Financial Stability Facility (EFSF) of the so-called ‘troika’, and in turn was required to sign a Memorandum of Understanding which brought with it draconian austerity measures. In addition, as rating agencies and investors started to doubt the solvency of the Spanish state, refinancing costs for public debt rose. The crisis therefore led to a reduced capacity of the Spanish state to provide social welfare (Haas and Huke, 2015). In addition to a decline in public sector employment, the imposition of austerity measures in the area of public spending became commonplace. Austerity was constitutionalised through the introduction of the requirements of the SGP, adopted as Article 135 of the Spanish constitution, thereby placing a permanent strain on the public sector. The austerity measures adopted also affected those of pension age. The statutory retirement age was raised from 65 to 67, remaining only at 65 for those with at least 38.5 insurance years. The insurance years required for receiving a pension without deductions were also raised from 35 to 37 years. In addition, the amount of pensions was no longer calculated on the base of the last 15 years of employment, but on the last 25 years, with a transitional period established until 2027. From 2027 a sustainability factor will be introduced that automatically adjusts the parameters of pensions to the development of life expectancy every five years (Busch et al., 2013). Other key areas of the public service were also subjected to major reforms. The health system was restructured and experienced far reaching budget cuts. The RDL 16/2012 made access to healthcare conditional upon social security contributions, with a serious impact upon migrants in Spain. As a result of the protests of medical staff and migrant support groups, however (and on which see more below), these reforms were mitigated in part, through the establishment of private insurance possibilities and the partial re-opening of the system for so-called ‘illegal’ migrants (Ruiz-Giménez, 2014). Unemployment benefits and other social benefits were also reduced from 2010 onwards, with some regions seeing tightened access to minimum wage schemes. Poverty rates also increased, especially among groups already vulnerable prior to the crisis such as single parents, families with children or migrants (FOESSA, 2014: 70). It is in this context, therefore, that we need to assess the development of an anti-austerity movement across Spain during this period. The cuts in welfare spawned a variety of protest movements throughout the Spanish state that were mostly regional in character, due to the mostly regional nature of welfare provision in areas such as welfare and education (Huke and Tietje, 2014). The welfare movements were in many cases inspired by the 15-M movement and adopted parts of its repertoire of action, such as radical-democratic, or prefigurative, assemblies. This allowed a range of groups, and types of participants (including workers, service users and local neighbourhoods) to overcome a number of the divisions that had prevented cooperation in the past (Huke, 2016). An exemplary case in this sense is the marea blanca in Madrid, which emerged as a reaction to the regional government’s radical plan to privatise the health sector in Madrid. After the plans became public, employees enclosed themselves in the hospitals (encierros) and organised assemblies with a massive participation of the workforce. This represented the birth of the marea blanca. Regular assemblies took place in every one of the affected hospitals that quickly expanded to include users of health services. As part of the marea blanca, workers’ interests were reframed as common interests of the population. Part of its effectiveness stemmed from its successful framing of health care as a public good which allowed its assemblies to reach a wide political spectrum and increase their social base beyond affected workers. The political pressure built up by the numerous protests of the marea blanca contributed to the failure of the privatisation programme in Madrid. Similar developments can be seen in the case of the so-called Yo Sí Sanidad Universal movement. This was a campaign that organised support for so-called ‘illegal’ migrants after their exclusion from public healthcare following the RDL 16/2012 (Ruiz-Giménez, 2014). Shortly after the decree was passed, the doctors association, SEMFYC, issued a call for civil disobedience, sparking more than 2000 doctors to declare that they would continue to grant universal access to healthcare despite any potential legal consequences (Legido-Quigley et al., 2013: 2). Yo Sí Sanidad Universal organised support groups for so-called ‘illegal’ migrants but also conducted workshops for health workers to inform them of the necessity of civil disobedience, and to point out loopholes and potential ways to continue treating migrants. In addition, the campaign documented and publicised the exclusion of patients and the consequences of those exclusions (including deaths) (Ruiz-Giménez, 2014). In Madrid, where the movement was the strongest, more than 20 support groups were established. These developments were, moreover, successful to the extent that the PP government issued a statement declaring that so-called ‘illegal’ migrants were to be readmitted to health care, albeit continuing to deny them health insurance cards (Huke, 2016). As we have seen, therefore, attempts to imposed significant welfare retrenchment measures were met with considerable public opposition. In the case of both marea blanca and Yo Sí Sanidad Universal this led to a considerable downscaling of the reforms pursued by the government. This resulted from a combination of prefigurative forms of radical action, combined with the attempt to raise a voice by those members of the public who retained their support for welfare reforms, and the refusal-prone inclinations of those working directly within the relevant sectors. As we see below, moreover, similar trends could be witnessed in another of the forms of mobilisation that gained prominence during the course of the crisis, the Iai@flautas. We are sons and daughters of the 15-M. The 15-M was such an important explosion of freedom that it injected us with energy to do things. Their name, Iai@flautas, derives from the words ‘iaio’ or ‘iaia’ (Catalan for ‘grandpa’ or ‘grandma’), and the derogatory name ‘perroflauta’ (Spanish for ‘crusty’) that was used in some circles and particularly within the right-wing media to refer to 15-M activists. Hence, they resignified the terms and subverted the usual connotations of idleness and carelessness. Furthermore, they found a name that is pronounced the same in Catalan and Spanish, but they spell it in a mix of both languages in order to illustrate their inner diversity of origins and background. The initial idea of Iai@flautas was soon replicated in other cities such as Sabadell, Terrassa, Sevilla, Madrid, Valencia, Castelló de la Plana, Palma de Mallorca, Córdoba, Murcia, Girona, Badalona, Mollet del Vallès, Montcada i Reixac and L’Hospitalet de Llobregat. Each of these nodes has its own local assembly, which is self-organised and autonomous from the others. Occasionally, activists from different assemblies meet in order to share their experiences and knowledge, to plan and perform a joint action, and to socialise in a collective meal. However, rather than a concrete organisational structure, what these grassroots assemblies share is a collective worldview that includes the notions of civil disobedience, pacifism, non-partisanship and defence of what is ‘common’. To reinforce their horizontal practices, they have always rejected the idea of having a visible leader, and they deliberately try to rotate certain positions and responsibilities within the movement. As with other anti-austerity movements, the main strategy adopted by Iai@flautas has been that of the occupation. The first target for their disruptive direct actions –which they call ‘travesuras’, Spanish for ‘shenanigans’– was Banco Santander, the main financial group in Spain and the largest by market value in the Eurozone. In October 2011, a group of Iai@flautas activists attempted to occupy one of their offices in the center of Barcelona to protest against the abuses of the Spanish banking system, and to challenge the decision of the Spanish government to bail out the country’s banks in a period of acute welfare cuts and austerity. In their second action, they tried to occupy an office of Fitch Ratings, one of the world’s biggest international credit rating agencies, to show solidarity with the Greek people and their battle against austerity. These first actions were in a sense incomplete, since they could not occupy the targeted offices and they had to gather and protest outside their premises instead. In September 2012, Iai@flautas performed one of their most well-known actions, the first-ever occupation of Barcelona Stock Exchange. A few days before the action, two activists were sent as spotters and realized the building was easily accessible. The committee that organised the action decided that six activists –in street clothes and pretending to be three old married couples– would enter the building and the other Iai@flautas would gather outside, trying to disrupt as much as possible the normal activity of the institution. The action was so successful that the six activists could open the doors from the inside, and up to 150 Iai@flautas were able to peacefully access the Barcelona Stock Exchange while shouting ‘Iai@flautas, a rising value’. The action was an attempt to delegitimize what they considered the ‘symbol and instrument of the criminal organisation of the 1%’, and to protest against the planned bailout that would save banks instead of saving people. They also called for a general strike and for the opening of a constituent process that should built a new legal and political framework from below. 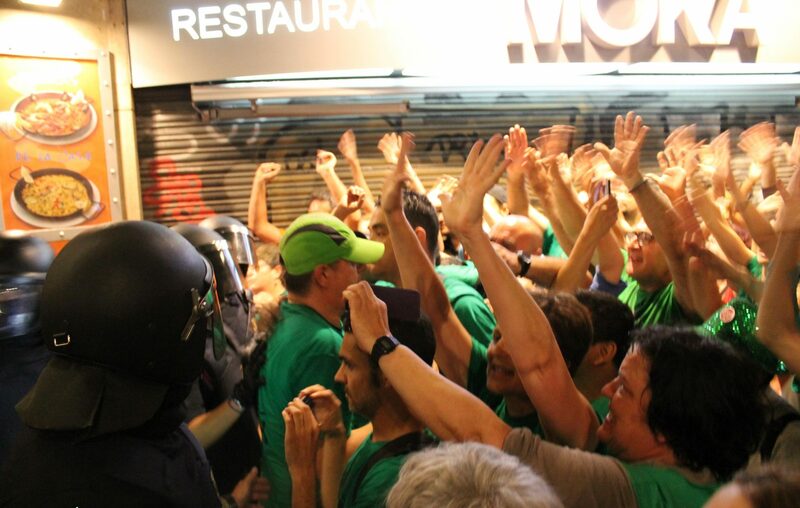 A reduced group of activists were able to meet the deputy director whilst the other Iai@flautas were supposed to finish the action with a march to Plaça Catalunya. Once they left the building, however, they realised they were surrounded by 80 anti-riot police officers and that they were being kept inside a kettle. Despite all police attempts, the activists refused to identify themselves and said they would only do so if they were under arrest. Eventually, some of the activists (the average age of which were 70 years old) started complaining about their health and their need to take their medication, allowing them finally to break through the police cordon. A crucial feature of Iai@flautas is that many of the senior people who initially engaged in the movement had been activists in the past, especially during the anti-Franco resistance struggles and during the early years of the transition to democracy in Spain. As such, one of the pillars of the movement was to recover the historical memory of the anti-Franco struggles, that is, to gather the collective knowledge produced in the clandestine struggles against the dictatorship and to share it with younger generations in order to improve current struggles. This is shown in the slogan ‘Anem lluny perquè venim de lluny’ (‘We are going far because we come from afar’) a variation of one of the main 15-M slogans ‘we are going slow because we are going far’. A key contribution of the initiative is to politicize, empower, give voice and make active again a group of people that, since it is not productive for the capitalist economy and receives state pensions and welfare benefits, is not ‘useful’ to society anymore. Some of the members were politically active before, some of them were not. How did they achieve it? By being non-violent and very friendly, having collective meals after every action and having spaces of common socialisation and leisure such as the choir. These collective experiences contribute to the creation of a sense of belonging for people who felt isolated and useless. We might consider the development of welfare during the European/Eurozone crisis as something of a double movement. We have seen increased disciplinary pressures from global markets and European institutions and an attempted de-politisation of budgetary discipline on the one hand; combined with increased everyday vulnerability and social inequality, a deepening legitimacy crisis of national and European institutions, but also mass protests that push for a re-politisation, on the other. As the case studies of the UK and Spain have shown, austerity and welfare retrenchment are far from uncontested. Anti-austerity movements saw the combination of pre-crisis radical groups that were often associated with the anti-globalisation movement, combining with those suffering hardship as a result of the austerity measures that were imposed following the crisis. These anti-austerity movements produced significant obstacles, routinely blocking, opposing, and/or making it difficult to implement in full the austerity reforms proposed by the public authorities. In this sense, we see a continuation of the frustration of neoliberal goals that we highlighted for the period prior to 2008. Two examples of that frustration, which we have pointed out in this chapter, are the difficulties experienced during the implementation of workfare in the UK as well as the failed attempt to privatise public hospitals in Madrid. These developments have in turn been faced with forms of association between those affected that have produced significant instances of self-determination and mutual aid, most obviously as seen in the case of Yo Sí Sanidad Universal which not only demanded universal healthcare, but also went on to actively provide it, in the face of legal prohibition. These moments of self-enforcement constitute forms of civil disobedience, which act as a democratising element within the existing political systems.